"I call this the 'recipe with legs' because every time I serve it, the recipe is requested. Even those who dislike yams and sweet potatoes love this tasty dish! 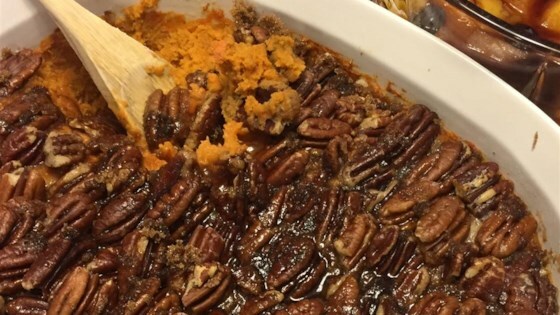 This dish can be frozen, but freeze it without the pecan topping. Defrost before baking." Poke yams in several places with a fork, then cook them on high power in microwave oven until heated through and soft, about 20 minutes. When cooled, remove skins and place the yams in a large bowl. Beat yams until smooth. Then beat in one egg at a time, blending after each addition. Stir in 1/4 cup brown sugar, 1/8 cup melted butter, salt, cinnamon, allspice and nutmeg; beat until the mixture is light and fluffy. Transfer mixture to an ungreased 3 quart casserole dish. Arrange the pecans in a single layer on top. Sprinkle with remaining brown sugar and drizzle 1/4 cup melted butter over the top. Bake for 25 minutes in the preheated oven, or until browned and bubbly. This casserole is creamy and crunchy, and not too sweet. Good, but nothing GREAT! I like the pecans on top and I did decrease the butter! Yam haters all agree! This is the bomb! Very easy to make and I love the ability to prepare earlier and freeze. A time saver and a delicious side dish.